Loftyhammer wrote: I can see he started, and got booked....and Burton got walloped....but anyone know anything more about young Martin's performance? I watched Burton (vs Leeds) over Christmas, on the TV. They are in a desperate fight for survival. Not sure if that's an ideal place to go on loan. Rob played as Villa beat Barnsley 3-1, assisting the second goal with a corner. "Scott Hogan claimed his fourth goal in three games two minutes later as he headed in from Robert Snodgrass' corner." Rob scored a last-minute winner as Villa won 1-0 at Sheffield United. 18' Chester heads wide from a Snodgrass corner. Not much else from Villa yet. 73' Not a bad delivery from Snodgrass but it’s easily dealt with by the Blades. Villa still pushing but running out of ideas. 90' 1-0 (Snodgrass) Stunning goal. Snodgrass cuts inside from the right and bends a delightful curling effort into the bottom corner. Moore stretched as wide as he could but he couldn’t reach it. A perfect shot from a player who is making a BIG impact in the second half of this season. Martin played 77 minutes as Burton lost 3-1 at home to Reading. He won the penalty for Burton's equaliser. "The second half sprung to life just six minutes in when referee Jones pointed to the penalty spot as Samuelsen was bundled off the ball by Dave Edwards rather needlessly." 9: Samuelsen delivers the ball to the back post where Turner gets his head to it but Reading manage to clear. 24: Martin Samuelsen takes a Brewers corner from the left but it goes straight out of play. 51: PENALTY! Martin Samuelsen is dragged down in the area. 66: Samuelsen tees up McFadzean on the edge of the box but his effort flies just wide. 77: Brewers sub.. Marvin Sordell on for Martin Samuelsen. West Ham's England Under-20s defender Reece Oxford has returned to Borussia Monchengladbach on loan. The defender, 19, spent the first half of the season at the Bundesliga club but was recalled in their winter break. Monchengladbach and RB Leipzig showed an interest in a permanent deal but Hammers boss David Moyes wanted to assess the teenager. Oxford has now rejoined Monchengladbach until the summer although no option for a permanent move has been agreed. He has made four appearances in Germany and RB Leipzig were optimistic of agreeing an initial fee of 9m euros (£8m), rising to 19m (£16.88m). Moyes, who took charge of West Ham in November, selected Oxford in three games in January but has allowed him to rejoin Monchengladbach's bid for Champions League qualification. They are seventh in the Bundesliga, three points behind second-placed Bayer Leverkusen, and host Leipzig on Saturday. Plymouth Argyle have signed midfielder Moses Makasi on loan from West Ham United for the rest of the season. The 22-year-old is yet to make a first-team appearance for the Premier League side but has been an unused substitute on five occasions this campaign. Makasi came through the Hammers' academy in 2014 and has played in all the club's EFL Trophy ties. His arrival comes after the Pilgrims were were forced to pull out of a bid to sign Everton's Conor Grant on loan. West Ham defender Reece Burke has returned to Bolton on loan until the end of the season. Burke spent the first part of the campaign on loan at the Macron Stadium, playing 15 times for the Trotters and scoring in the 2-2 draw with Reading before returning to east London after the New Year's Day victory over Hull. The 21-year-old made three starts for the Hammers, playing in all three FA Cup matches they played in January, and scored the winner in their 1-0 FA Cup replay victory over Shrewsbury. Toni Martinez has joined Spanish Second Division side Real Valladolid on loan until the end of the season, subject to international clearance. The 20-year-old striker, who hails from Murcia in the east of Spain, will hope to gain more valuable first-team experience when he links up with the Whites and Violets. Martinez has already made one breakthrough this season, making his first-team debut for West Ham and featuring in all three Emirates FA Cup ties against Shrewsbury Town and Wigan Athletic. A prolific marksman at U23 level, the youngster bagged eleven in 16 appearances in Premier League 2 Division 1 and the Checkatrade Trophy. Martinez’s loan to Valladolid, who sit tenth in the Spanish Second Division table, two points outside the play-off places, is the second of his Hammers career, with the forward having also spent time at EFL League One club Oxford United in the spring of 2017. Bolton played tonight, but Reece Burke was not in with the squad. Here are the next matches for our current loanees. Rob played 67 minutes and was named man of the match as Villa beat Burton 3-2. He was subbed at 2-0, immediately after assisting the second goal of the match - his 10th assist of the season. He picked up a caution midway through the first half for a foul. "Scott Hogan opened the scoring for Villa on 33 minutes, rounding off a flowing moved which included a delightful throughball from Robert Snodgrass. ."
"Albert Adomah doubled the lead on 65 minutes when he squeezed in a header at the back post after Snodgrass floated a measured cross from the right." 20' Snodgrass pulls back Dyer down Burton’s left and the Scot becomes the first player in the book. 33' GOAL: Villa 1-0 Burton. What an excellent goal. Snodgrass exchanges passes with Grealish and Hourihane before sliding in Adomah, who crosses first time for Hogan to tap home! 1-0! 53' Grealish collects a pass from Snodgrass and fires wide from distance. He had Adomah and Hogan in decent positions and probably chose the wrong option that time. 65' GOAL: Villa 2-0 Burton. Adomah heads in Snodgrass’ brilliant cross to make it 2-0! 67' Snodgrass is replaced by Axel Tuanzebe - making his debut - while Adomah makes way for Josh Onomah. ‘Oh Albert Adomah...’ rings around Villa Park. Robert Snodgrass - 8*. Snodgrass enjoyed a wonderful January and he kicked off February in the same fashion. He instigated Hogan’s opener by drifting inside from the right, exchanging passes with Grealish and Hourihane before sliding in Adomah to tee up Villa’s No.9. The Scot’s second moment of magic created Villa’s second goal. He delivered a delightful ball to Adomah at the far post midway through the second half and Villa’s top scorer made no mistake. Rob played as Villa won the second-city derby, beating Birmingham 2-0. 21' Well worked corner from Villa sees Snodgrass in space on the left with time to lift a cross to the back-post. Jenkinson headed away. 39' Snodgrass worked his way in from the Villa right and feeds Adomah on the left of the area, it looked like Jenkinson was going to cut it out but he missed the ball, it ran through to the Villa man who cut on to his right and hammered a rising shot straight at the Blues goalkeeper. 44' Snodgrass free kick to the back post, Jedinak rose highest and headed back across goal and Kieftenbeld was there to clear off the line. 68' Villa corner, bit of pinball, cleared by Snodgrass into the Holte End. 78' Snodgrass worked himself a yard but dragged just wide of the post from just inside the area..
Martin played as Burton drew 0-0 at Ipswich. 6: Good start from the Brewers as a lovely passing move ends with Samuelsen's shot in the back of the stand. 31: Martin Samuelsen picks up the ball on the right but his effort is way off target. FT: Key passes at Portman Road - Hope Akpan 3. John Brayford 2. Martin Samuelsen 2. Toni made his Valladolid debut, coming on as a 72nd minute substitute in a 1-0 defeat at Granada. He was booked within a minute for a foul. Reece played the first half as Bolton lost 2-0 at promotion-chasing Cardiff. 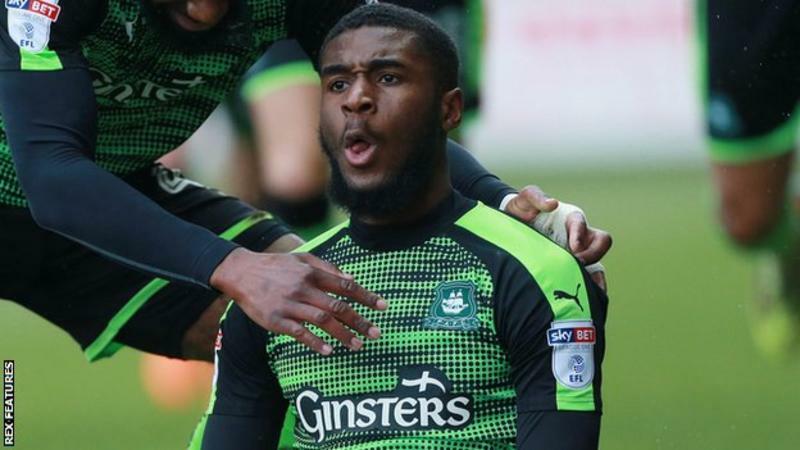 Moses made his league debut, coming on for the last 15 minutes as Plymouth beat Wimbledon 4-2. He was cautioned for stopping a quick free kick. 75' It's debut time! Mose Makasi coming on for Antoni Sarcevic. There are 15 minutes to go here. 86' Makasi into the book for trying to stop a quick free-kick. The Whites boss made three changes to his side – resting David Wheater, Mark Little and Zach Clough from the team which drew with Fulham. Reece Burke, who had replaced Wheater in the back three, was substituted at half time, Parkinson conceding that the team needed some extra experience to cope with Cardiff’s powerful attack. “I wanted to put a bit of freshness in the team and knew Cardiff had pace at the top of the pitch. I felt young Reece would be the one to deal with that,” he said. “In fairness to Reece he actually did alright. I just felt at half time, 2-0 down at a place like this, I wanted to get the experience of David Wheater on. Argyle’s third and final substitution came in the 75th minute when midfielder Antoni Sarcevic, who was on a booking, was replaced. It meant a Pilgrims’ debut – and a first league appearance of his career - for 22-year-old West Ham United loan signing Moses Makasi. Burke heavily criticised for his first half performance on a Bolton forum I looked at. Reece returned to the starting lineup as Gladbach lost for the fourth consecutive match, going down 1-0 at home to Dortmund. He was rated (on whoscored.com) a 5.9 for his performance at right back. He was cautioned early in the second half. Reece played as ten-man Bolton lost 2-0 at QPR. 22' QPR have the ball in the back of the net as Reece Burke slices his clearance but the flag was already up for an offside earlier in the move. Big let-off for Wanderers. 57' Wanderers now playing in a 4-4-1 formation with Reece Burke moving to right-back, Sammy Ameobi right midfield and Jem Karacan left midfield. 62' Another brilliant pass from Jem Karacan to play in Reece Burke down the right. He sends in a searching cross for Sammy Ameobi which QPR head behind. Rob played 88 minutes as in-form Villa lost 2-0 at Fulham. 2' Villa lining up with an unusual formation. Tuanzebe starts at right-back, Elmohamdy at right mid and Snodgrass on the left. 52' Hogan gets close with a header from a Snodgrass free-kick but Fulham break up the other end with Sessegnon. 63' Villa are really struggling to get a foothold in this game and in truth, if any team is going to score, it will be the hostsSnodgrass is in his favoured role on the right now with Onomah on the left but neither flankers have made an impact. 66' First chance for Snodgrass as he gets the chance to use his skills down the right. He cuts inside and tries to bend on into the corner, like at Sheffield United, but this time his effort is too weak. 71' Snodgrass is caught in possession allowing Johansen to break. Just as he’s about to shoot, Tuanzebe arrives out of nowhere to make the interception. 88' Piazon comes on for Ayite for Fulham while Davis replaces Snodgrass. Just two minutes of normal time remaining. FT: Bruce: "Snoddy - can we sign him from West Ham? We have got a chance if we go up. If we don’t then I don’t think we have. All of those things are three months down the line but we will try our best." Martin played as Burton drew 0-0 at home to Nottingham Forest, who played more than an hour with ten men after a wild challenge on Martin saw a red card show to Eric Lichaj. "The Brewers were given a golden chance after half an hour when Forest's Eric Lichaj was shown a straight red card for a wild lunge on Martin Samuelsen." "Clear chances remained at a premium from two out-of-form sides, with Samuelsen volleying straight at Pantilimon"
"Burton went on to dominate, with Darren Bent heading just over and Samuelsen's long-range strike forcing a low save from Costel Pantilimon." 26: Eric Lichaj with one of the worst tackles I've seen, will he be off? 28: Red! Eric Lichaj is rightly sent off for a terrible tackle on Martin Samuelsen. 36: Great delivery from Davenport, Samuelsen leaps at the back post but his header is an inch wide. 42: What a chance. Davenport pings a worldie of a ball to Bent who heads down to Samuelsen but his effort is parried by Pantilimon. 44: Samuelsen with some tricky feet before he clips the ball to the back post but Akpan's header is wide. 48: Another flowing move as Davenport clips a ball to the back stick, Samuelsen heads back across goal but Bent's header is over. 64: Martin Samuelsen tricks his way in to the box but his cross is blocked by Danny Fox. 71: Martin Samuelsen with a fierce effort but Costel Pantilimon parries away. Pretty much all about Samuelsen. Reece played at Right Back as Gladbach won 1-0 at Hannover. He was awarded an overall match rating of 7.2. Reece came on in injury time to help Bolton see out a vital 1-0 win over relegation rivals Sunderland in midweek. played as ten-man Bolton lost 2-0 at QPR. He then played 81 minutes as a defensive midfielder in a 0-0 draw at Norwich. KICK OFF: Norwich get us underway at Carrow Road. Wanderers in a 5-3-2- system with Reece Burke, Jem Karacan and Darren Pratley the midfield three. Come on you Whites! 34' Filipe Morais leads a swift Wanderers counter-attack down the left but only has Reece Burke up in support. 64' Reece Burke in the right place at the right time to dispossess Nelson Oliveira and clear after Ben Alnwick was caught out of position after fumbling the ball. 81' Final change for Wanderers as Derik Osede comes on in place of Reece Burke. The West Ham loanee has been exceptional in that unfamiliar defensive midfield role today. FT - Burke "Tough battle today in a new position. But we got an away point and clean sheet! Thanks to all the travelling support"
Rob was withdrawn sick at half-time as Villa drew 1-1 at home to Preston. 22' Snodgrass whips in a free-kick to Terry at the back post, he heads it across goal and Hogan shoots but it’s easily saved by Rudd. Rob then played the full match in a 4-2 comeback win at Sheffield Wednesday, assisting one goal and scoring an injury time penalty to wrap up the victory. 40' Snoddy should score. A rare break up field for Villa sees Hutton cross deep to the back post. Snodgrass is there, unmarked and should score. He dives to meet the cross and plants his header straight into Wildsmith’s hands. Either side of the keeper and Villa are ahead. What a waste, and Snodgrass’ reaction tells it all as he lies down on the floor, head buried in the turf. 67' Villa level with a thunderous header from Whelan against his old club. He buries Snodgrass’ teasing cross as Villa start to commit men forward. Game on! 70' Villa getting a lot of joy down the right now as Snodgrass starts to turn it on. His deliveries into the box are causing problems. Another floated delivery to the back post is almost met by Davis but it just flies over his head. Villa fans are now in full voice. They went VERY quiet when they were behind. 81' Snodgrass winning so many fouls down the right. 83' Jedinak heads over from Snodgrass’ free-kick. 86' Snodgrass whips a cross into the back post for Hourihane but he’s denied and it’s out for a corner. 90+3' Wildsmith guesses the correct way but Snodgrass scores! Martin played as Burton won 2-1 at Barnsley, and followed that with 85 minutes in a 1-0 home reverse to Millwall. 56: Davenport takes the resulting free kick to the back post but Samuelsen's header loops over the bar. Toni made his full debut, playing 57 minutes as ten-man Valladolid lost 2-1 at Cordoba. Valladolid were 1-0 when Toni was withdrawn. He was cautioned late in the first half for a foul tackle. Reece played 82 minutes at Right Back as Gladbach surrendered a 2-0 lead to draw 2-2 with Werder Bremen. He was awarded an overall match rating of 6.5. Reece made his 20th appearance of the season for Bolton, playing the full match in a 1-1 draw at Reading. 55' Reece Burke leaves Mo Barrow in a heap in the Wanderers box after racing back with the forward racing through on goal. Brave tackle from the West Ham loanee but timed to perfection! Rob played as Villa won 3-0 at bottom-placed Sunderland, assisting the second goal with a corner. 7' Oviedo concedes a corner to Elmohamady, Snodgrass curls it in before Grabban wins another. 8' This corner an outswinging one, Snoddy drops the ball onto John Terry’s head. The captain met it with plenty of power and it just missed the post, but the referee had blown for a foul elsewhere in the box. 25' Villa have another corner - it’s a really poor one by Snodgrass’ standards. 31' Villa fans are up on their feet celebrating, thinking Hogan’s ****ed header from Snodgrass’ cross is in - from their vantage point, it probably looked like it. It landed on the roof of the net though. 45' Snodgrass currently down receiving treatment, but he’s okay to continue. 45+3' It’s now 2-0! James Chester heads home Snodgrass’ latest corner and there’s the half-time whistle. 55' Snodgrass, on the edge of the area, goes to pull the ball back to Elmohamady but is scythed down by Oviedo, who is duly booked. Chance for Villa to wrap it up, here. Martin played 53 minutes as Burton lost 2-0 at home to Brentford. He was substituted with the score still 0-0. HT: 0-0 Samuelsen has had the best chance of the half as he ****ed Dyer's cross over the bar from 6 yards, but it's goalless at the break. Moses Makasi says he hopes he can establish himself in the Plymouth Argyle midfield after scoring on his full English Football League debut. The 22-year-old, who is on loan from Premier League side West Ham until the end of the season, opened the scoring as the Pilgrims drew 1-1 at Fleetwood. Makasi came into the side after Antoni Sarcevic was ruled out with a groin problem that has required surgery. "I've been waiting for this moment for a long time," Makasi told BBC Devon. Makasi - who has played six times for West Ham's Under-23's in the EFL Trophy over the past two seasons - had made just one substitute appearance for the Pilgrims since joining on January transfer deadline day. "I thought to myself that I'd be having a bit more game time, but you've just got to knuckle down and keep working and be patient," Makasi added. "Hopefully I took my chance, but we'll see next week if I'm in the team. "I'd like to think I took my chance with my goal, but there's still a lot more to come and it is up to me to show the Plymouth Argyle fans what I've got. "Hopefully I'll get a run of games, but I've got to work hard on the training field and stay humble." Paddy Madden's second half equaliser denied in-form Plymouth a seventh successive League One victory, a run which has taken them into the play-off positions. Midfielder Moses Makasi celebrated the first start of his senior career by scoring for Plymouth Argyle in their 1-1 draw away to Fleetwood Town. The 22-year-old loan signing from West Ham United, put the Pilgrims ahead in the League One encounter at Highbury Stadium. Makasi, in only his second appearance for Argyle after arriving at the end of January, struck in the 16th minute with a curling shot past Fleetwood ‘keeper Alex Cairns. However, striker Paddy Madden equalised for the home side early in the second half when he slotted home from close range. Play-off chasing Argyle had to settle for a point despite taking an early lead against Fleetwood at Highbury Stadium. In an end-to-end encounter, the Pilgrims went ahead in the 16th minute with a well-taken goal from Moses Makasi. The on-loan West Ham United midfielder made his first start for Argyle because of a groin injury to former Fleetwood promotion winner Antoni Sarcevic. Hunter decided not to try a shot and instead went for a pass to Conor McAleny but it was over-hit and Argyle were able to recover defensively. The Pilgrims made the most of that let-off when they took the lead in the 16th minute. Taylor linked up with Ruben Lameiras, who spotted Makasi in a good position on the edge of the penalty area. Makasi got the ball onto his left foot and curled it around Cairns into the corner of the net. It was the perfect way for the 22-year-old on-loan West Ham midfielder to mark the first start of his senior career.